Healesville is a township 52 km north-east of Melbourne, just south of the Watts River which is a tributary of the Yarra River. Upstream from where Healesville is situated gold was found at New Chum Creek in about 1859. By 1860 New Chum was a village. However, it was the creation of tracks to the more distant Gippsland and Yarra Valley goldfields in the 1860s that resulted in a settlement forming at Healesville and its survey as a town in 1864. It was named after Richard Heales, Premier of Victoria, 1860-61. The first land sale at Healesville was in 1865, and in the following year there were 30 business premises, including six hotels and a primary school. 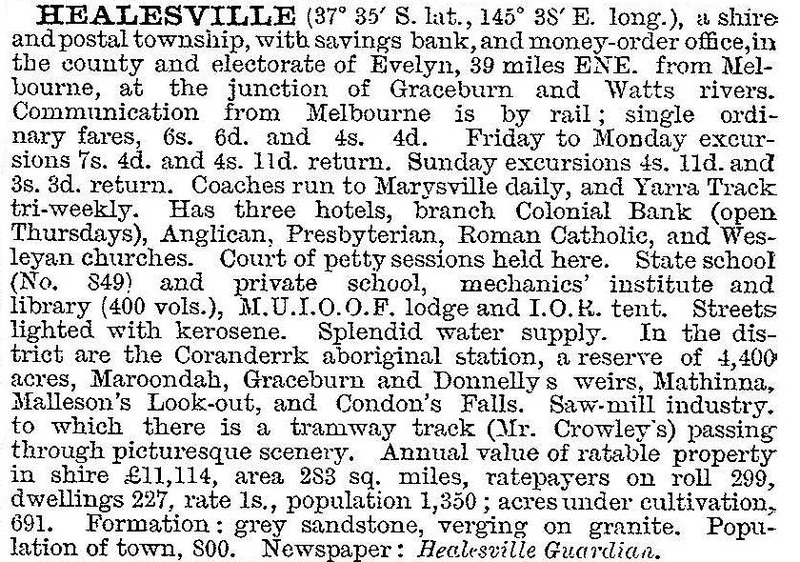 Healesville was also selected as a site for ‘neglected black and half-caste children and an asylum for infirm blacks’. Thus the Coranderrk reserve on Badger Creek, south of Healesville, was created in 1863 as one of seven Aboriginal reserves in the colony. In 1884 Coranderrk was made a 'permanent' reserve. According to Richard Broome, 'Around 1900, its population was over 80, including 13 children who still attended the Badger Creek School ... among the white children. The farm and hop gardens were productive, cows were milked to supplement rations, and bush tucker supplemented the meat ration. Visitors came to view the Aborigines and the residents compensated for these gazes by selling boomerangs and crafts.' In 1948 its permanent status was revoked by an act of parliament and the land split up for the Soldier Settlement Scheme, though not for returned Aboriginal soldiers. As the Gippsland goldfields declined some miners took up farms in Healesville. Timber cutters found employment, and hop gardens were established. In 1881 the railway had been opened from Hawthorn and Lilydale, 12 km south-west of Healesville. Expectation of the railway's extension to Healesville stimulated business and population growth. In 1889 the railway link was opened, two years after the Healesville shire had been created on 30 September 1887. The scenery of Fernshaw was then more readily reached from the Healesville train terminus and tourism entered Healesville's local economy. Gracedale House of 60 rooms was built in 1889. Orchards and vegetable growing increased their acreages, along with a successful tobacco plantation. Elaborate country retreat residences were built alongside hotels and guest houses, and a Tourist and Progress Association was created before 1914. 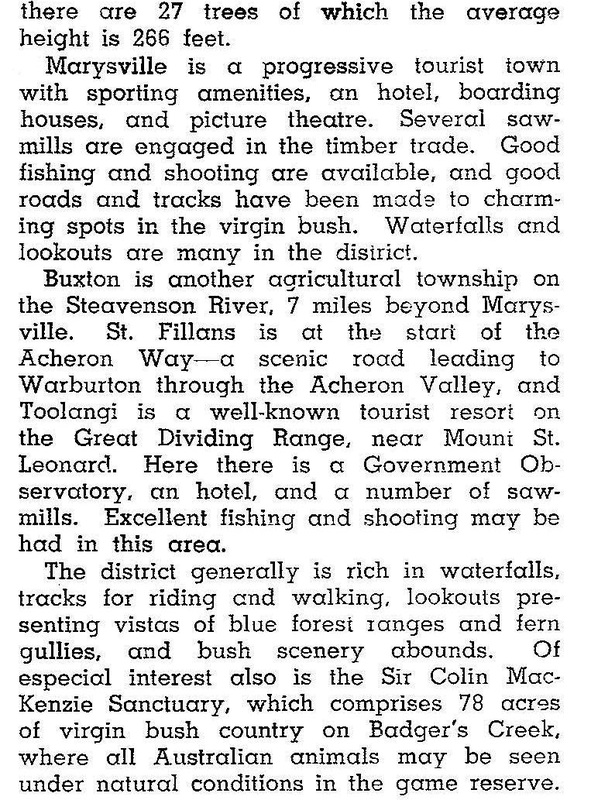 In the 1920s the Association published ‘Healesville, the world-famed tourist resort’, listing over 40 beauty spots and 20 hotels and guest houses. The construction of the Maroondah Dam in 1927, replacing the weir, brought several hundred workers to Healesville. Their departure, and the onset of the 1930s Depression exposed Healesville's restricted range of industries. Timber and tourism were not stable enough for sustained growth. Notwithstanding the Depression, the 1930s saw increased motor tourism, partly bypassing Healesville, and decreased railway patronage. Only 10% came by rail in Easter 1934. Tourism was still active but a local newspaper commented that Healesville would be ‘heaps better off calling itself the good-time town instead of the world-famed-tourist-resort – that's got whiskers on it’. In 1934 the Sir Colin Mackenzie Sanctuary for Australian Fauna and Flora was opened on land that was formerly part of the Coranderrk reserve (Badger Creek). The Healesville Sanctuary became one of Victoria's premier tourist attractions. Forestry operations in the 1940s had increased Healesville's population, and continued activity was required to sustain them. During the 1950s the shire unsuccessfully contested the Melbourne and Metropolitan Board of Works view that the watersheds should be kept unlogged. Small industries making foundation garments, knitwear, electrical appliances and soft drinks contributed to a much needed diversification of employment activities. The Golf House guest house was taken over for the RACV Country Club in 1951. In January 1957, a new hospital was opened and in 1961 the central school (1952) was replaced by a high school. A new swimming pool was opened in 1964. The former railway station (1902) and court house (1890) are heritage listed buildings, but the most eye-catching building in town is the unlisted Grand Hotel (1888). The mechanics’ institute (1892) and a Uniting church hall are also interesting. The township has a comprehensive range of facilities. In addition to the shopping centre there is a district hospital, Queens Park with a swimming pool and sports facilities, a showgrounds and sporting complex, five churches, halls, Catholic school and State primary and high schools. Healesville shire until the 1950s had undergone only minor boundary adjustments. However, the relatively close Yarra Glen had more in common with Healesville than with Eltham shire, and the Yarra Glen district was added to Healesville shire on 18 June 1958. Northwards, Buxton went to Alexandra shire on 1 October 1963. Healesville remained the larger commercial centre in its shire, having 64 commercial establishments compared with 35 in Yarra Glen in 1988. Healesville shire ceased on 15 December 1994 when part was united with parts of Whittlesea city and Diamond Valley shire and most of Eltham shire to form Nillumbik shire. The other part was united with Alexandra and Yea shires and parts of Whittlesea city and Broadford, Euroa and Eltham shires to form Murrindindi shire on 18 November 1994. At that time Healesville shire contained Yarra Glen and the localities of Badger Creek, Christmas Hills and Toolangi. The urbanisation of Healesville shire was reflected in the median house price rising from 70% to 80% of the metropolitan average between 1981 and 1986.